Wondering what to do for your under cabinet lighting and you want to make sure it's subtle? The 1M U-Shape Aluminium LED Bar Kit from LED Montreal, with its 120 Epistar 2835 LED chips, gives you great brightness and a clean look. It comes with a light diffuser that will allow you to even out the look and reproduce a neon effect. This Rigid LED Bar has a U shape, meaning it will allow a straight lighting angle. The connectors on each side also make it possible to combine up to 4 bars and make a longer setup. 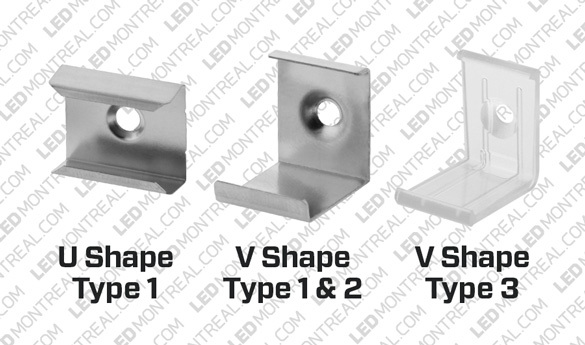 The 1M U-shape Aluminium Bar for LED Strips comes in 3 different types: thin, medium and wide. You can choose your preferred type in the drop down menu. Please note that the Rigid LED Bars are not self adhesive. We recommend using the Double sided 3M Acrylic tape for LED Strips to 1) secure the LED circuit to the bar by adding 3 to 4, 1 inch pieces of tape on the 1 meter circuit and snap it in place 2) install the Rigid LED Bar to the desired surface. We recommend adding double sided tape on the full length of the bar for secure installation. If you prefer using plastic clips to screw into the wall and hold the bars, you can add those to your order by selecting them in the drop down menu (available for Type 1 only). What is the lumens output of the fixture?